These colors are largely unverified--if you see a car above which clearly is NOT the color it claims to be, email the webmaster and he'll find a more suitable replacement. Hopefully. Battleship Grey, Claret, Mediterranean Blue and Pastel Green Metallic are not shown. Arbor Green, Birch Grey, Lavendar Grey, and Pastel Blue Metallic as shown above are correct, as those photos were taken by expert extraordinaire Urs Schmidt. The more common colors are probably fairly represented. My biggest doubts, not being a true expert, are the photos of Pacific Blue and Pastel Blue. They may be correct...or not. This is very useful. I would be good to have more than one example of the colors if available. Some of the photos are of better quality than others which can further cloud the issue. Although most photos will be of modern interpretations of the colors, this is still a terrific resource. Thank you for going to the effort in creating this. I have a factory color chip set for the late (post mid '53) 120s not quite sure how to share the info but if you need assistance I can do my best.. IT IS ABSOLUTELY NOT LEAVING MY POSSESSION! A very fine resource. I have a 53 FHC originally painted pastel blue...i'm in the process of restoring the car and would like to know if anyone can provide the paint codes so i can make up a batch and see what it looks like on metal. i'd also like the code for metallic pastel blue as it appears to be a more attractive color...any help would be appreciated. thanks. I have too factory metal sheets of original colours, sadly I have only 6 colours, very useful for me when painting the 120s. In my opinion regarding the pictures of CREAM cars, some of them are Old English White. And don't be wrong beetween Pastel Blue and Pastel Blue Metallic, even if both named Pastel Blue. I think to remember that on Heritage the names are the same if metallic or not, I must recheck to be sure, same as per Pastel Geen and Pastel green Metallic. 31 colours were coded on a few years ago XK Gazette, with old code and with new codes for actual paints. that the 2 colours are different. Again on the heritage certificates, they write Cream when Cream . . . . But it is an endless story. Our Heritage sheet lists our 1956 XK140 as Cream not Old English White, but the colors above say that Cream wasn't available in that year??? Under www.jag-lovers.org you can find a JDHT colour reference card with BD, PJ and ICI codes for many colours. PPG (Nexa)codes can be seen at the XK Club page. I am desparately looking for any code for pastel green metallic! currently engaged in restoration of a pair of xk 150 s roadsters. ready for paint! Take a note that I had 2 original 120s in Bronze to be restored , and I think that it is lesser dark than we all have tought. And I think also it depends of period, as example alloy 120s could have a different bronze from steel 120s, not yet sure but . . .
does not mention thi colour1 very cofusing to say the least ,can any one help with codes? I don't see Pacific Blue on either list, which is curious, as my 56 Mk1 Heritage Certificate specifies Pacific Blue as the original color. It is now a gold/sand color, old, and peeling to reveal what looks like an original black, or possibly Indigo Blue, ala the brochure "chip". Not making things any clearer are the two different blue Jags shown as Pacific Blue on this page and the "more..." link, one very dark and one light. Is there a Jaguar colors PhD in the house? XKR & XK8 production numbers by COLOR and year ? It is clear that the color shown in the photo above exposed is not well reflected. Tank you. The car I have is British racing green, which is what the Heritage certificate says, but having talked to the first owner, he tells me the car was green over a cream. This I assume is similar in scheme to the ex Stirling Moss car LVC345. Also a copy of the buff log book says green/cream. Car is 669085 120 FHC. I see lots of questions relevant to my issue of looking for a code for pastel blue and/or pastel blue metallic , but never any answers - are there any and where should I look ? 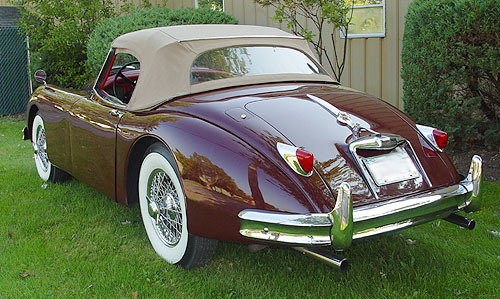 I am in the process of restoring my XK 120 LHD, left factory 1953, sold in NY 1954. According to the Heritage Certificate of my car, which has matching numbers, the original colour was "pastell blue". According to the discussion this colour would not exclude "pastell blue metallic" or? 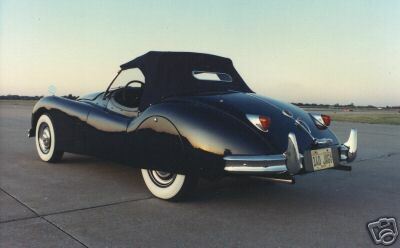 Did "Cotsdwold Blue/Metallic" exist in 1953/54 on XK 120s? I am researching and trying to source a color known as 'Claret'. It is a very dark red. Does PPG make this in single stage urethane? 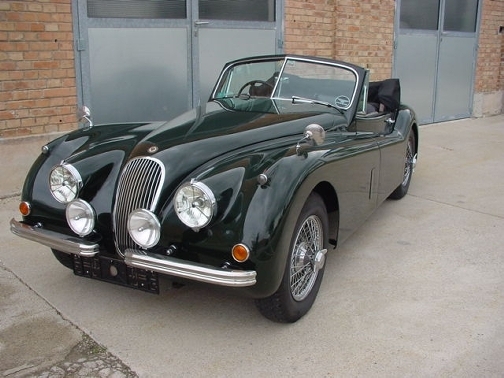 Hi, my father has a Jaguar xk120 roadster and wants to restore it to the original color of pastel green. We found the code online. Anyone knows where we can buy the paint? Hello, does anyone have a modern equivalent paint code available for Suede Green? Thanks in advance for any assistance. J.P.